Last week, world headlines marvelled at a seemingly unprovoked underwater attack on 53 year old scuba diver Rene Umberger in Hawaii, caught on video. According to the media (and by some accounts, according to Rene herself), she was simply documenting damage to coral reefs off the Kona Coast before stumbling across poachers capturing fish for the commercial aquarium trade. When Rene began to film their activity, one diver swam directly towards her, violently ripping her air-supply regulator from her mouth in what may well be described as ‘attempted murder’. However, as with many media reports, things here are not exactly as they seem. Having dived and spent time with Rene during a ten day intensive underwater photography workshop in the Philippines, I have no doubt that she would have received some hard earned satisfaction from the world attention that this cowardly attack has brought her intense, long-term campaign against Hawaii’s aquarium trade. Curiously, despite major media outlets peddling the sensational story of the innocent Umberger being attacked without provocation, I can find no reference whatsoever to this harrowing event – even in the ‘News and Interviews’ page on the website of ‘For the Fishes’ – of which Rene is the Director. What hasn’t been adequately reported is that this encounter was part of the ongoing war that Umberger and her organisation have been waging against these human predators to protect the marine life of Hawaii for many years. Far from being unprovoked, the actions of Rene’s underwater attacker are no doubt in my mind a defensive measure. The existence of activists who are proactive at every opportunity is the bane of industries such as the aquarium trade that denounce all scruples and cater to ignorance to serve a commercial imperative. Rene’s presence in the water at this precise moment along with the positioning of her camera (and that of the second diver who filmed the attack from a distance without so much as flinching) is testament in my mind to intent and resolve on both sides. While her organisation may be reticent to draw attention to Rene’s long-term activism to pander the media’s penchant for innocent victims and to avoid counter-claims of culpability, there is no doubt that the poacher’s brazen action has lifted the profile of their central cause. Rene’s personal passion and her willingness to educate me in 2012 about the plight of fish caught in the wild for home and commercial aquariums transformed my thinking. As an avid diver, I adore fish and prior to meeting Rene I had been planning to install a large home aquarium. However, her deep, well-educated position on the the diminished quality and duration of a fish’s life in captivity caused me to totally rethink repurposing the wall between my dining room and study. And I was absolutely inspired to follow in Rene’s steps when the Western Australian government flouted its brutal and futile measures to decimate large sharks from its waters. I was incensed by Premier Colin Barnett’s absolute disrespect for the ecological ramifications of implementing such a short-sighted, ill-advised retaliation against a small number of shark-related fatalities. Sold to the media as a noble and necessary war against great whites, not a single white was amongst the 66 sharks slaughtered during the three month ‘trial’ which only served to disrupt the local ecosystem. When the cull started, I and many like-minded spirits thought of ourselves as hard-core environmental activists when we attended a few protest rallies. We braved heat waves, brandished our hand-made banners and shouted our slogans with hundreds of others: ‘Save Our Sharks! Save Our Sharks!’ I’d worked for at least two hours creating my handmade banner that screamed ‘I dive with big sharks – Find A Better Solution!’ (video below at 2:38, 8:51, 11:30 and 14:23). And I felt with absolute certainty that I was doing my part to save some beautiful shark from an unjustifiable bullet to the brain as protest speakers wove my slogan into their speeches and my banner was featured on news stories around the world. But the shark massacre continued and it appeared as though the politicians and their deadly baited hooks were fixed in their resolve to ignore public outcry. And one by one, the casual activists who showed up to rallies with inflatable sharks in our hands and fluffy great white hats on our heads realised that coordinated rallies around the country, worldwide media attention and international consternation hadn’t been enough to stop the cull. So many of us walked away, shrugged our shoulders, and went back to dreaming of a world where someone else might one day achieve a revolution of sanity and humanity that we could not. Environmental activists like Rene Umberger are the real deal. They fight the battles for ecological protection and reform relentlessly over decades, undeterred by the extent to which the embedded paradigms of dollar-driven exploitation on one hand and community complacency on the other may slow the course towards sustainable and morally conscionable solutions. I would never suggest that Rene and her fellow diver deliberately provoked the extreme aggressive defences of the poachers they were filming. However, being willing to put one’s life at risk for the sake of the cause (and having the foresight and composure to capture it on camera from multiple angles) may simply be a more powerfully strategic form of activism than showing up at the state library and shaking a home-made banner, then losing passion when nothing appears to change. Whether we are fighting for yellow tangs or great whites, whether we shake our banners for the news cameras or have our regulators ripped from our mouths, news media and sadly the public that consumes it have a very short attention span. If anything can make a difference in protecting our oceans from those who misunderstand or seek to exploit it, it is tenacious, passionate individuals who are willing to fight tirelessly to expose the problems and to advocate better solutions, sometimes at considerable cost and risk to their own well-being. I do not believe that Rene Umberger was an innocent victim of an unprovoked attack. She is a die-hard crusader for a critical cause that she will never abandon. I hope that the poachers will be prosecuted for this violent attack against Rene and one day be sanctioned for their self-serving capture of ocean wildlife. I can only hope that the sensational footage of this brazen underwater attack brings the issue of fish poaching in Hawaii to the surface for long enough to be leveraged by activists like Rene and her organisation towards legislative progress, should they choose to acknowledge it. And I pray that others who care deeply about the life and health of our oceans and every part of their ecosystems are inspired and empowered by Umberger’s example of passionate tenacity in seeking to expose those who would destroy them, urging them to find a better solution. 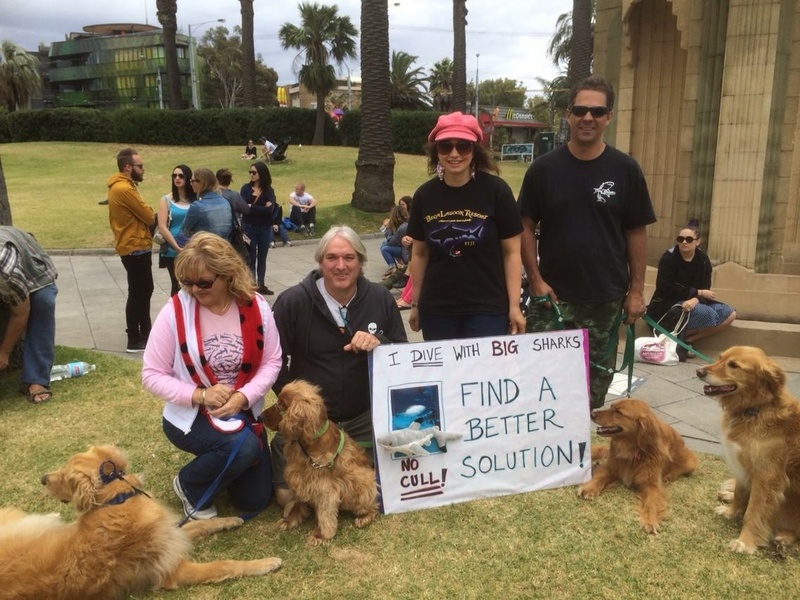 This entry was posted in Blog and tagged activism, colin barnett, ecology, fish, greenpeace, kona, life, news, ocean, rene umberger, scuba, scuba diver, sea shepherd, shark cull, Sharks. Bookmark the permalink.